Beary Happi comes to life as the next-generation teddy bear. He combines a classic plush toy, a free app, and the latest multimedia technology from iPhones or iPod touches to create a truly interactive and lovable companion. 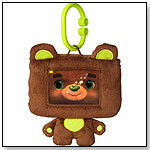 A mix of snuggly plush teddy bear and interactive fun, HappiTaps is changing the way little ones play. Start by purchasing the HappiTaps cover, then download the HappiTaps app from the App store. 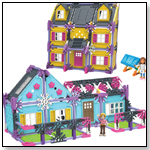 Put the cover on a iPhone or iPod touch and watch your a new pal come to life with interaction, games, and activities. Launch date: November 2011. — As of 10/5/2012 this product had 4.8 out of 5 stars from 6 reviews on Amazon.com. Pros: Keeps electronics safe; App is entertaining and free. Cons: There is no plastic to protect the actual screen. The EZee Glider from Glide Bikes allows children to gain confidence, improve motor skills, increase coordination, and learn balance at their own pace all while having fun. Balance Bikes do not have training wheels and pedals to get in the way, so children learn the important first step in riding a bike- BALANCE. Pushing off with alternating feet as if the child were running from a seated position, the child can learn balance and control. Once the child becomes more stable they begin to glide with their feet off the ground. Glide Bikes also incorporates a unique foot peg system to allow kids to have a place to rest their feet while gliding. These pegs can be locked into place with one simple to use, tool-free pin allowing the foot pegs to be installed or removed in seconds. — As of 10/5/2012 this product had 4.6 out of 5 stars from 14 reviews on Amazon.com. 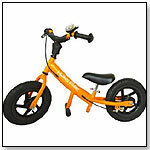 Pros: Air tires glide smoothly; bike is light enough for kids to handle; durable. The Dream Cheeky iLaunch Thunder is a Missile Launcher made for iPod touch, iPhone, or iPad. Strike fear into the hearts of fellow cube-dwellers with the iLaunch Thunder. Wirelessly controlled by an iPod touch, iPhone, or iPad, the iLaunch Thunder combines the best of Bluetooth technology and extreme innovation with a bit of insanity…With a 270 degree horizontal rotation, a vertical flexibility of more than 40 degrees and a shooting distance of around 25 feet, the iLaunch Thunder will cover more than 1,400 square feet of their workspace. That definitely gives users more than enough coverage to declare some serious office warfare. Launch date: December 2011. 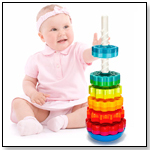 Enjoy countless hours of fun with a toy based on Tigger from the Winnie the Pooh series. The colorful black-and-orange tiger rests on his bouncy tail and plays the "Bounce Bounce" song for listeners. 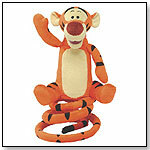 Tigger waves and bounces as the music plays. The doll is made of sturdy polyester and features a control unit, allowing you to set the appropriate volume for the toy's song.